When it comes to choosing vinyl siding for your home, you might do it to enhance the overall look of your home. It’s a cost-effective way to update your home and make it look newer and more elegant. However, you might find yourself stuck when deciding between vinyl siding and insulated vinyl siding. The difference is astronomical, and many people want to know why they should choose one over the other. The choice, of course, is yours. However, insulated vinyl siding is something we here at The Window Broker know is imperative if you want to save money and energy during the cold winter months here in New York. The cost of having insulated siding installed along the exterior of your home is a bit more than regular vinyl siding. However, the payoff later on is much greater. The insulated siding we use is fitted with form-fitting expanded polystyrene along the back side of the siding. This allows you to reap a number of benefits that you might not have already thought of. When your home is insulated with this type of siding, you spend less on energy costs. This is the biggest reason that so many homeowners are choosing this type of vinyl to update their homes. It’s designed so that your home holds in the head or cold air more efficiently. When this happens, your heating and cooling systems work more efficiently. When your house is not allowing heat or air to escape, your air and heat work less since the house stays comfortable for longer periods of time. When the heat and air are not running as often, the house is comfortable and your wallet is happy. With so many different options to choose from, our insulated siding is a perfect choice for you. We can customize almost anything you want from the color to the width of the siding. This means you can have your home look just as you envisioned before re-doing your siding. Finally, insulated siding has fewer seams. It’s a lot longer than traditional siding planks, which means you have fewer breaks. This makes for a much cleaner look and much more enhanced aesthetic appeal. The first step to making your house look cleaner, more updated and more appealing is calling our experts. 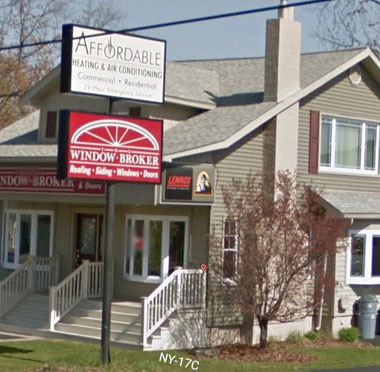 With years of experience behind us, The Window Broker has ample experience working with houses of all sizes and shapes installing new insulated siding. Our team of experts is always on hand to help you choose from our differing siding solutions as well as answer your many questions. Call us today at (607) 798-9954 or fill out the form on this page to schedule a free estimate with our siding experts to begin your home’s transformation.